He managed to convince five people to prepare for the burial. Most villagers were scared of venturing out of Kumirbari for fear of man-eaters. Of the five who went, three stood guard and two dug the grave. "We will burn in hell. Kaka's spirit will haunt us. We don't even have money to carry out the rituals. Our house was razed to the ground," an inconsolable Mridha said as he recounted the horror of May 25, the day the cyclone struck the island. Harendra was not the only Hindu to be buried. In Sonagah village, 55-year-old Ashu Bala Barikh died when a wall collapsed on her. Her son Bishwajeet Barikh tried hard to look for firewood to light her pyre. "There was no wood. Everything was wet and we had no option but to bury her. Her grave is outside the village," he said, pointing to a broken embankment. The villages were a swirl of liquid mud. "The tide was a towering military march. The waves were 15 feet high and loomed towards us. The wind had become very strong. Baffled, we ran with our children. I thought it would blow me away. It was chance that saved us and we managed to reach a safe place in time," said Kalipado Gayan, Mridha's neighbour. His hut was next to the embankment. The safe place was a lone double-storey concrete building in the village, which saved more than 300 lives. "All of us huddled on the roof of the building in complete darkness, praying that the winds don't bring down the house," said Patiram Mandal, owner of the house, which was knee-deep in water. When the villagers ventured out next morning, they saw their houses razed, trees were uprooted and water gushing into the village through broken embankments. In a cyclone, winds move in a circular motion around a centre of the cyclone. The speed at which the motion occurs is called the wind speed. It is different from the cyclone speed--the rate at which the centre of the cyclone moves from one point to the other. The villagers could not identify their houses. Rebuilding was impossible without first plugging the broken embankment. "We did not have bamboo or sandbags. We somehow managed with sand. The entire village, including women, toiled for two days to repair the broken embankment. We did this without food or even drinking water," said Govind Mandal, resident of Bhuliapara village, close to Kumirbari. Monoranjan Haldar of Kalidaspur village in Gosaba block recalled it had rained incessantly a day before the cyclone. "The weather was stormy and suddenly, as if, a bomb exploded around 11.30 in the morning. The waves in the Sirsa river in front of our village were huge. We frantically tried to stop the embankment from collapsing when we heard the sideway embankments, Chotomollakhali 4 and Sandeshkhali 8, caving in. We found ourselves facing five-foot high waves. All we could do was run," said Haldar. Gopal Mondal of Chotomollakhali village said that his 80-year-old father had never seen such an impact ever. They took shelter in the two or three two-storey buildings in the village or on rooftop of the village school. "We saw houses breaking like toys in front of us," he added. The sea surface temperature in the Bay of Bengal was around 28C, a degree above normal. The speed of a cyclone is normally slow during its initiation, but the intensity is high. As it reaches the dissipation stage over land, the speed picks up, but the intensity lowers due to friction with the land. In case of Aila, even after hitting land, it was in the state of initiation and thus its intensity was higher. A preliminary imd report said the cyclone retained its intensity for about 15 hours after it hit land as it was close to the Bay of Bengal. It lay centred over the Gangetic delta for quite some time, ascertaining the availability of moisture, the report said. This is peculiar nevertheless because pre-monsoon storms rarely hit West Bengal. The last time a cyclone hit the state was in 1989. "Cyclones in the Bay of Bengal are usually pushed in the northwest direction, towards Andhra coast and Orissa, by the Coriolis force," said Mahapatra. The Coriolis force, named after a French engineer and mathematician, determines general wind directions and is responsible for the rotation of hurricanes and other low-pressure systems. Studies have proved earlier that the difference in Coriolis force between the northern and southern regions of Bay of Bengal makes the wind blow in a northwest direction. On certain occasions, the wind flow bypasses Orissa and Andhra coasts and is pushed towards Bangladesh by anticyclonic formations or the westerlies from the land. So, West Bengal remains safe from the cyclones. But Aila formed in the central Bay of Bengal and moved north because of two forces the anticylone in Myanmar from the east and westerlies from the west, said Mahapatra. Several conditions favoured Aila's formation in the central Bay of Bengal. Mahapatra explained. Monsoon had set in in the Andamans on May 20 and brought with it moisture-laden south westerlies. This added moisture in the winds of the Bay of Bengal. Wind speed in the lower troposphere, 1.5 km from the sea surface, was around 37 km/hr in southern Bay of Bengal and about 9 km/hr in northern Bay of Bengal. This led to the curling of winds because difference in wind speed or direction can cause the air to rotate. Technically, it is termed positive relative vorticity. These conditions led to an area of depression in the Bay of Bengal on May 20, which developed into a cyclone on May 23 and hit the Sunderbans isles on May 25 afternoon destroying life and property. 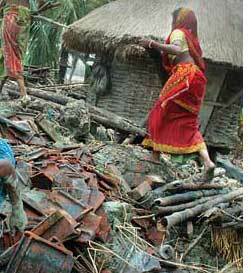 On May 23 though, imd predicted that the cyclone would hit 110 km away from Sagar islands in the Sunderbans. It revised its prediction the next day the cyclone would hit 50 km from Sagar. A few hours later, on the 24th, the prediction changed the cyclone would hit Sagar. But 24th was a Sunday. "It was very tough to communicate the message to the villagers. We were able to send messages to 14 gram pradhans. There was not much time left for us," said Amiya Bhusan Chakraborty, block development officer (bdo), Gosaba. "We informed village heads on their cell phone." But in more than 80 per cent of the villages, there is no electricity and the village heads need to come to Gosaba just to charge their cell phones. Chakraborty reiterated that despite the power problem, he had tried his best to communicate the message. When Down To Earth (dte) visited the six worst-affected villages, the villagers said if they had the information in time, they would have moved to higher land with their cattle. Das said the village had no prior intimation--and thus preparation--to counter such a disaster. "The administration had not communicated anything to us," he added. Chakraborty said a disaster management plan for the place is of immediate importance. "There is no such plan. We have only been provided one speedboat for emergencies. We need more," he said. The Gosaba block development office is short of staff. It has 30 employees against the sanctioned strength of 50. The administrative set up is rather peculiar. The district magistrate's office is in Kolkata, two hours from Gosaba. Most blocks have 50 per cent or less manpower and the logistic strength was hardly adequate in the face of a disaster of such scale. The West Bengal government also did not mobilize the National Disaster Management Relief Battalion in Kolkata for rescue and rehabilitation work. The state government cut a sorry figure. Irrigation minister Subhas Naskar admitted the state had taken a lot of time to reach the people. He attributed the delay to the scale of the disaster and the lack of access to remote areas. Criticizing the response mechanism, an expert attached with the National Disaster Management Authority said the West Bengal government had failed to build the state-level disaster management authority. The federal model of disaster control under the command and control of home department and both central and state level disaster management authorities--along the lines of America's Federal Emergency Management Authority--were supposed to provide information and be the backbone for ground-level implementation operations. undp supported the project. But the state government never took initiatives to execute the model seriously and the state level disaster management authority has remained mostly on paper. A unicef -supported community based disaster preparedness project was also launched but no effort was made to link the two projects. According to a senior government official, the disaster management department had prepared a detailed state-level disaster management plan with the Jadavpur University and sent it to state departments. The civil defence department, he said, was still considering it. M L Meena, disaster management secretary, gave a standard response "We are trying our best to manage the disaster. That is all I can assure now." The lack of coordination within the state departments was also evident, said Sumit Poddar of the disaster management unit of Rotary India. It resulted in information not reaching on time. "What is the use of keeping the Sunderbans Affairs department if it cannot be given enough power, resources so that it can be used as a nodal department to maximize coordination?" asked Sunderbans expert Tushar Kanjilal. The coordination is even poorer at the local level with politics playing spoilsport. The ruling cpm- led Left Front has been completely routed in the recent elections in the districts where Aila caused maximum devastation. Hence it took time to find the exact pattern of response so that its political opponents could not score brownie points. Meanwhile, Trinamool Congress, the leading opposition party in West Bengal, used its clout in the Centre to extract help for the victims and win the first round of Aila politics. The two political establishments at loggerheads went for one-upmanship the state government demanded the disaster be declared a national one and Rs 1,000 crore relief; Trinamool leader Mamata Banerjee urged the central government not to give money to the state directly and wanted the relief distributed through the local administration. Precious time was lost in this. The state government though did not miss out on an opportunity to take credit. The chief minister lauded Subhas Naskar and Kanti Ganguly, ministers of irrigation and Sunderbans affairs. He said they were "toiling" in the relief operations. Environmentalist Subhas Dutta said it was not a small disaster that a few leaders could take charge of. "A government-level well-thought out plan and its execution are required." But by the time a plan is in place, the losses would assume huge proportions. 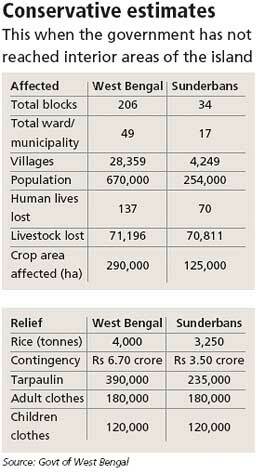 State government sources said 70 people died in the Sunderbans (see table Conservative estimates). The embankment had broken completely in a 400-km stretch; it was quite vulnerable in another 565 km of the total 3,500 km. There are breaks in about 800 points. The district administration's figure of loss of life in Gosaba stood at five dead, none missing and no cattle deaths. The rules of counting the dead are if a body is not found, no one is considered dead. If a complaint is not lodged, one cannot be reported missing. This includes livestock and humans. The actual scale may be far higher as the administration has not reached interiors of Kumirbari, Satjelia or Chotomollakhali villages. "We know 38 people died in Sandeshkhali II block and we had seen more dead bodies floating there," a survivor refuted the government statistics. Although the administration claimed that dead livestock were being buried, the villagers rubbished the claim. "Where is the place to bury?" asked Mondal of Chotomollakhali village. Some villagers had to bury their cattle between the river and the embankment. In most places, the embankments could not be repaired so the danger of fresh inundation remains, said Khiti Goswami, Public Works Department minister. Naskar admitted there were not enough people to repair the embankments. Of the 800 points, 87 are large-scale breaking points where the embankments could not be repaired. "In some areas, the embankments are 14 feet high, but even that proved inadequate. Perhaps, we need to raise it to 18-22 feet in future and the base width to 100 feet," said Naskar. He admitted it was a sign of climate change and increasing water levels. "Why can't you build embankments like they do in Bangladesh?" asked a disaster hit of the West Bengal chief minister during his visit to the affected areas (see box 150-year-old mud structures). There was a red alert on the night of June 6. Nature and not administrative preparedness saved the Sunderbans on that night, when the threat of higher than usual tides due to a full moon lurked high. Fearing the worst, the administration put up 99 shelters. The tides did not reach the feared levels. But it did cause destruction. All work by villagers to repair the embankment came undone. Eighteen breaches were found in Chunakali. Carcasses of cattle buried between the river and the embankment resurfaced. Chakrabarti sent an sos to the state government to send bleaching powder and asked for 200 personnel to bury the carcasses again. The threat remains as the state wing of imd has not ruled out the possibility of a depression and cyclonic weather in the near future. It may prove disastrous in tandem with a high tide. "We survived today but for how long?" asked Basanti Mondal of Mousuni island. She has been stranded on slightly high land for the past 10 days and has little confidence in the government. The government's track record since the disaster evokes little confidence within the likes of Basanti. Even two weeks after the cyclone, the sight of a boat was a ray of hope as people waited anxiously on the embankments with empty bottles and utensils. If a boat came by, people screamed. "My mother is ill, she is thirsty"; "My baby needs water to drink." Their scream pierced the heavy noise of the generator-pulled boats towing in the middle of the river. Some people lined up their cattle. "Take my cows. They will die. I don't want money. Just take them away," urged Arvind Mandal of Sonagah village. There is only one functional tubewell in the village and villagers often have to walk four km to fetch water. Indrajeet Barikh, a graduate, said 2,000 cattle died during Aila and 200 died because they drank saline water. Diarrhoea and other infections' spread was alarming, with no arrangement of bleaching powder. Sixty-eight-year-old Tarapada Mandal died of dysentery on June 4. "She was fine till the day before. She was suddenly taken ill and by evening she died. There are 14 others suffering from acute dysentery," Tarapada's son Ganesh Mandal said. There is no medical relief," Haldar added. Even honey makers' business was completely destroyed. Anup Mandal of Kumirbari suffered a loss of Rs 150,000. One hundred and fifty boxes of bees were destroyed. "These bees used to fly to the Sunderbans and bring nectar. All my bees that produced about 60 kg of honey every fortnight are dead," he said.With the entire irrigation land submerged in seawater, all standing crops were destroyed. Chances of irrigation for the next season are bleak. Farmers whose land is inundated by seawater are waiting for the water to dry up or recede. Some farmers said it would take at least four monsoons to wash away the salinity of the land. "Even if the water recedes there is no guarantee of crop yield. Either the seeds will not germinate, or the yield will be very low," said Ghazi Khan of Dulki village. Nearly half the population of the Sunderbans dependent on fishing suffered major losses. Their daily income has come to a standstill. Kalipado Gayan of Kumirbari used to catch meen and bagda, prawn spawns, from the river and breed them in the village pond. He cannot go fishing till the embankment is repaired. "Since the embankment is broken fishing is not possible. If I catch the fish and put them in the pond they will again swim back to the river. I am jobless for the past 10 days," he said. Some of the villagers, who could, have migrated to Kolkata, Canning, Bardhaman and other places nearby. The others are stranded. The government had made no transportation arrangements for them. Government records state there are 99 relief camps set up in 14 gram panchayats in Gosaba block. One such relief camp, in Kumirbari, provides a meal once a day, with no living arrangements. Villagers lived on boats. "We have got only two kg rice as relief," said Bishemvar Biswas whose current dwelling is a boat, in which he lives with his family of five. In Kalidaspur village, more than five families adjusted under one tarpaulin sheet. Twelve days after the disaster, the government said it had distributed 4,000 tonnes of rice, 390,000 tarpaulin sheets, and over 500,000 packets of water. Choppers were used for only four days to bring relief to the people. "It should have been used for at least 10 days. The death toll will only rise now," a government official said on condition of anonymity. 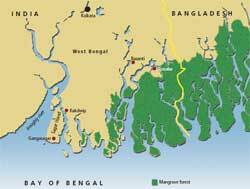 Kanjilal wants a long-term policy to save the Sunderbans and its people. "It's not the matter of what government has done in two weeks of the cyclone. It's about what government should do may be over next 10 months and 10 years," he said. Aila is not the last storm. "We should have a master plan, which should include the embankments," Kanjilal said. It's about the safety of millions of people in the 54 habited islands of the Sunderbans. It will also be about the life of the boy whose birth the Barikh family celebrated in Sonagah, a day after Aila--after much struggle. Since morning, on May 25, Jharna Barikh of Sonagah village was feeling the pain. She wanted to rest and told her husband Sushanto that it would soon happen. While Sushanto sat outside the hut, happy and apprehensive, Jharna would twitch in pain each time she felt the contractions. Suddenly, there was a clamour and Jharna saw people running around. The next minute, her husband was lifting her in his arms and the pain was getting worse. He stepped out of the hut, carrying his pregnant wife, only to meet waves. The Aila had arrived and the couple, and Sushanto's father, was stuck. Series of cyclonic tides hit them but they kept Jharna within their grip. "It was a nightmare," Sushanto recalled. "The tide was pushing and lifting us and we could see our house come crashing down. We struggled for an hour and held on to a tree trunk. Finally, the grip weakened. Jharna was unconscious and we feared the worst." Jharna regained consciousness after a few hours and they spent the night under a damaged hut nearby. The next morning, Jharna delivered a baby boy. "We lost our house but God has gifted us a son. We could not distribute sweets. It is our Aila baby," they said, together.